You are currently browsing the tag archive for the ‘bute’ tag. Signs of Aging or Healthy Living? When we recently took Mija in for a checkup for her back pain, the vet apologized in advance. “I’m about to make your life more complicated,” she said. Then she proceeded to describe the twice-daily medicine mixing procedure for Mija. And it’s true – no big deal. It helps that I now work from home. It could be a problem if I were rushing out the door to make it to work by eight o’clock every day. I did however find it amusing one afternoon when I gathered all of the medicines in one place. 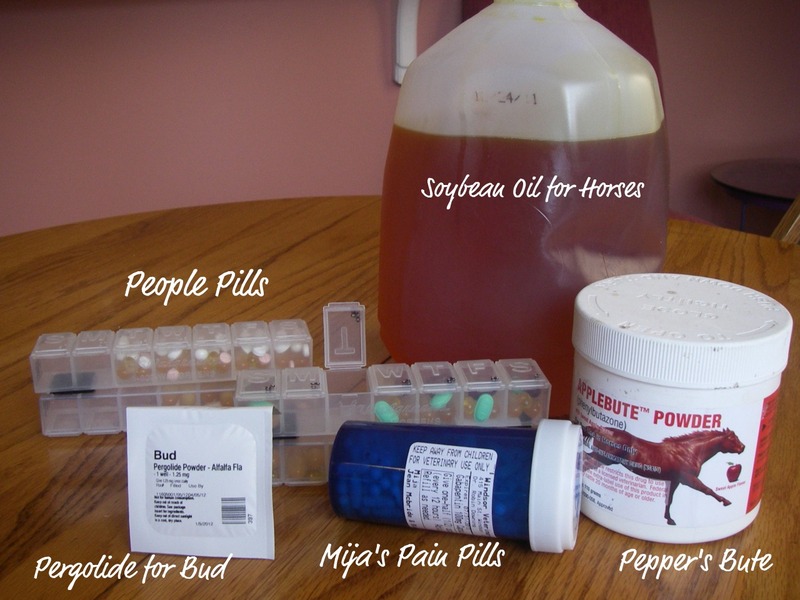 Two people, two horses and one cat have amassed quite an arsenal of supplements/medications. We’ve got potions and powders and capsules and liquids going into our bodies all the time. Are all these meds part of the process of keeping aging bodies going, or simply attempts to be as healthy as we possibly can? Maybe it’s just an issue of semantics. Is it a natural part of aging, or is it prevention of aging? I do remember a time when I took a couple of aspirin now and then, and a multi vitamin and I was good to go. Maybe it’s that we know more than we used to about keeping bodies healthy. Medicine has made some mind-boggling advances. Or maybe it’s that we Baby Boomers are realizing that life really does have an ending date. I don’t know. I think I’m still figuring it out. Any light you can shed on this? The one thing I do know is we are all in it together. This is Pepper not eating! Miss Pepper has decided beyond a shadow of a doubt that we’re trying to poison her. She’s one hundred percent certain of it. And as a prey animal, a horse can’t be too careful. There’s danger at every turn and one must always be on the alert. Ever on the alert, ears back, ready to run in an instant if she needs to flee. You may be wondering what we’ve done to her food, to convince her that she’s being poisoned. We’ve changed the brand of Bute that goes in her food. 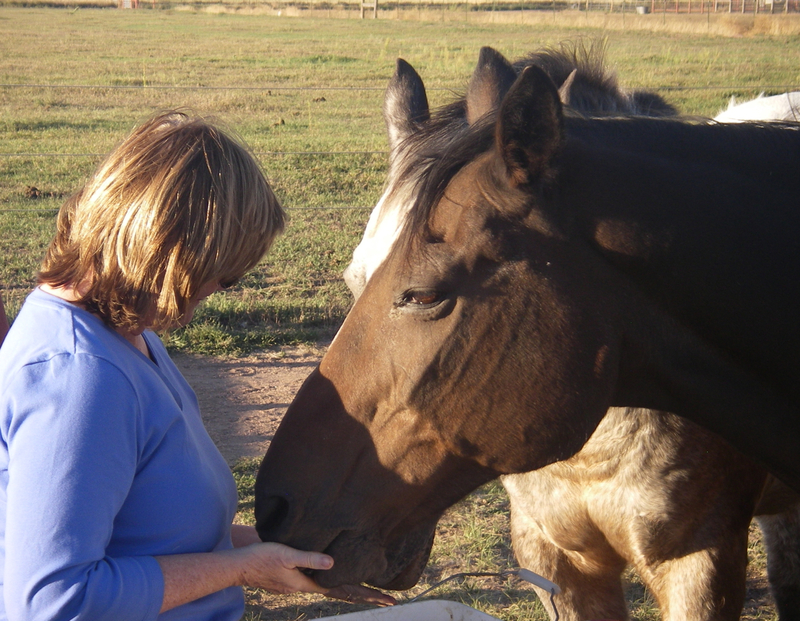 The medicine that eases her achy, arthritic hocks, and helps her walk (and run) with less pain. The medicine that over the summer has helped her eat better, put on weight for winter, and generally feel ever so much better. When our vet brought us a new supply, it was different. Apple flavored instead of cherry. Apparently the manufacturer had to change things. And she doesn’t like changes. Like the fairy tale of the Princess and the Pea, where the princess could detect one tiny pea placed under a pile of mattresses, Miss Pepper found the new medicine with one whiff. She didn’t even have to take a taste. At least I think that’s what she was saying, if my horse translator was working correctly. 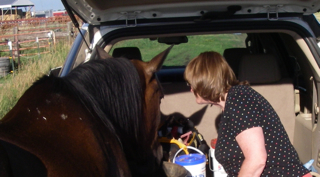 Then she’d try to eat Bud’s food, or graze a little on the dried grass beside the car. I tried to explain, really I did. I held her feed pan up and scooped out a handful of grain, hoping the direct approach would entice her to eat. She did take a bite, but that was it. “Nope, I’m not eating it.” Then she walked away. The next day, as an experiment I didn’t put the Bute into her food. 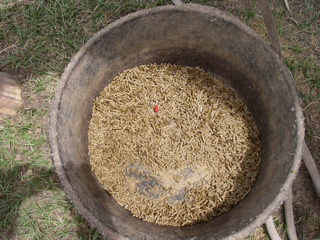 It would be a slow process of introducing just a few grains of Bute into her feed, gradually increasing to the recommended dose. On Saturday I added the tiniest amount to her feed, thinking I could sneak it past her. She sniffed and walked away. I persevered and directed her back to her feed. Eventually she ate what was in her pan. He’s happy to clean up whatever Miss P. leaves behind. His palate isn’t nearly as discerning. The season is changing here in Colorado, as evidenced by the lovely cool mornings and evenings. Summer is giving way to fall. It’s time to pull up the comforter, turn off the fan overhead, and snuggle into the blankets. That early morning alarm doesn’t seem so appealing, when it’s dark and cold. In the pasture the last few days I’ve noticed that Miss P. seems hungry. She’s often the first one to the gate, and on many days, she’s waiting patiently for us to arrive. Last night she spotted the truck as we rounded the first turn, and made a beeline toward us, and her dinner. She needs more calories to keep warm, now that mornings and evenings are chilly. We’d reduced her grain over the summer, because she didn’t need it. All that lush grass was keeping her happy. She’s actually put on a good amount of weight. And that pleases me. It gives her a bit of a head start for winter, when keeping weight on her is a challenge. About mid summer our vet suggested that we start Pepper on a daily dose of Bute, to ease the pain in her arthritic knees. It has made a tremendous difference in her quality of life. She’s been a different mare. Everything about her seems lighter. Now she gets a little hustle going when she comes toward us. She used to plod along, as if every step hurt. 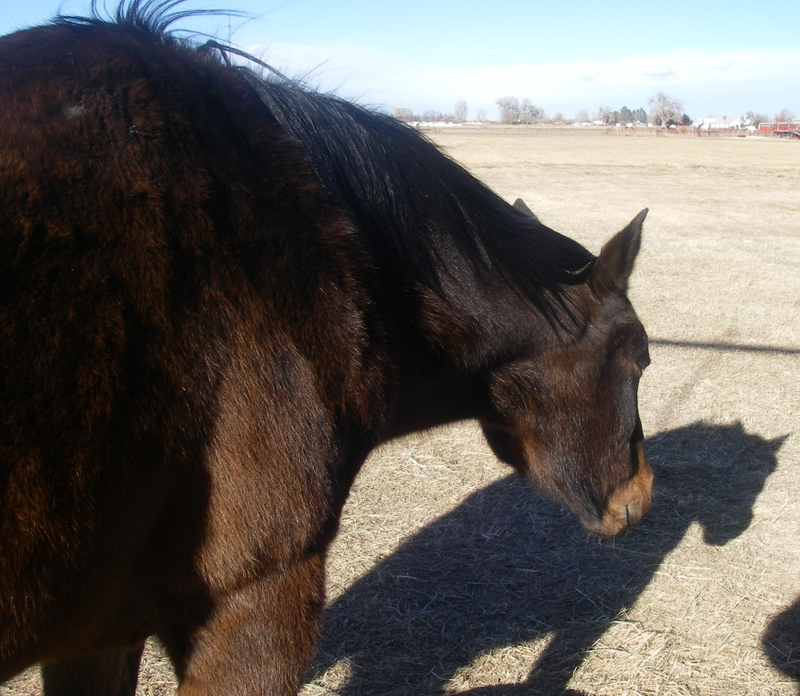 Chronic pain wears a person, or a horse down. If we don’t have it, we can’t even imagine how exhausting it is to manage that pain. I feel a little guilty that we waited so long to give this pain relief to our sweet girl. There may be side effects with long-term usage of Bute, but we agreed with our vet that at twenty-eight, Pepper needed pain relief. We’re going for quality of life in her old age. I hope it ‘s the right decision. Have you ever had to make a tough call about your animals? I’m looking for an inventor. Someone who can make a popsicle for horses. Preferably one that has a dose of bute contained in its frosty deliciousness. Of course I have no idea if Miss Pepper would even take one lick of such a creation. Though yesterday, I was pretty sure she could be tempted. 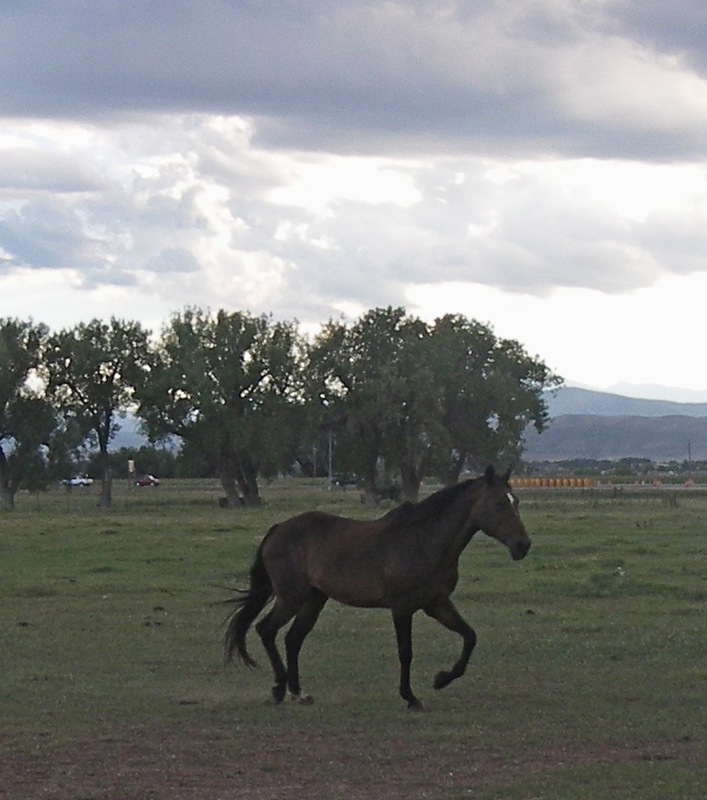 I was going to an evening event, so had to make my way to the pasture in the late afternoon. It was hot. That time between 4PM – 5:30 or 6 is just plain nasty. And that was exactly the time I was trying to interest my old sweeties in eating. They were waiting at the gate, which I thought was a good sign since time was an issue. Lately I’ve had to search them out – they’re usually in the shade of the shed or the stand of old cottonwood trees. But no, there they were at the gate. And they marched right out to their feed pans. Bud tucked into his grain without a moment’s hesitation. No surprises there. Pepper on the other hand, wasn’t so interested. She looked into her feed pan and sighed. 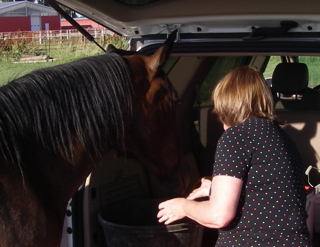 Then she nosed around the back of the vehicle, searching out her much-loved alfalfa cubes. She pulled the bucket toward her, spilling the contents. She did have a slight look of remorse on her face. I swirled the grain hoping to make it more appealing. She took a nibble or two. Then back to the cubes, which required her to stretch her neck into the back of car. I thought I could outsmart her by moving the bucket of hay cubes. She wasn’t interested in eating dry old grain. It was just too hot. She nosed around her feed pan once more and then walked away. She circled the car, nibbled a little grass and a bit of hay that had fallen into the road. 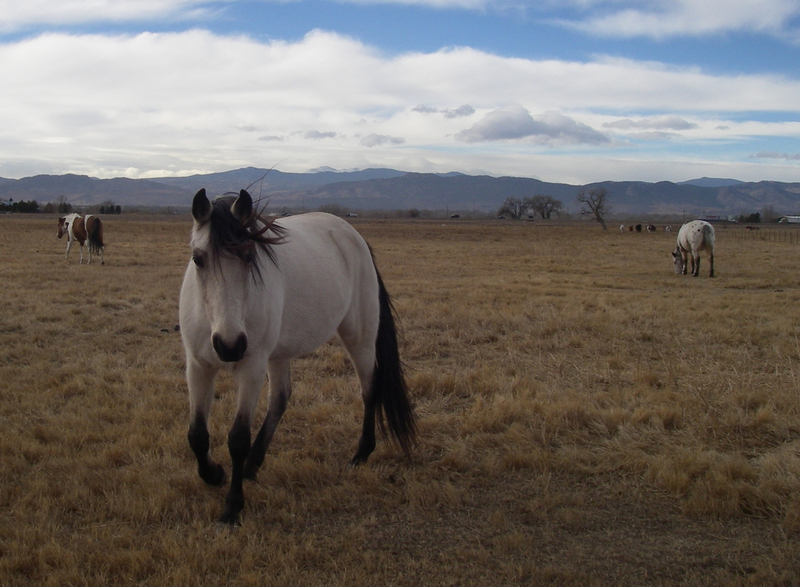 And then she stood in front of the gate, only this time asking to be let back into the pasture. “No thank you. I’m finished.” She nudged the gate and I let her in. When I got back to the car, I noticed that Bud was just finishing Pepper’s grain. I guess the heat wasn’t getting to him. And a dose of bute can’t hurt. It’s supposed to get over 100 this weekend. Think of me as I look for a new way to get Pepper’s meds into her. Horse popsicles are sounding pretty good.